I first heard the phrase “breaking open the moment” at a Green River Writers‘ Retreat. –If you ever get a chance to go to one of their retreats or workshops, GO! You know how you’re reading a book and something happens and then it’s gone, and you think, “That felt a little thin. I wish they had done more with that scene.” They needed to break open the moment. And you know how you’re reading a book and you finish a scene, and you think, “Wow! I was so there! I feel like that actually happened to me!” They broke open the moment. 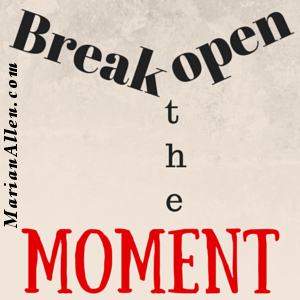 Breaking open the moment means unpacking all the good stuff inside that moment for the reader. Yes, sometimes there’s more power in implication, and sometimes there’s more humor in indirection, but sometimes breaking open the moment is necessary. Breaking open the moment slows down the pace. It spreads the inside of what’s happening all over the page and leaks off into the reader’s mind and heart. Her chair. Her very own chair. Not a bed cranked up at the head, not a wheelchair, but her chair. She had almost forgotten what it felt like, after a month in hospital rehab, but the chair hadn’t forgotten; it embraced her. She settled into the contours she and the chair had made together over the years, so familiar, yet so strange after what seemed like years. Her daughter lifted Sweetie Pie into Genarose’s lap, the huge cat overwhelming the thin legs. Hands shaking, Genarose stroked the calico fur, sleeker than the fur of any other cat, feeling the purr pulsing as she savored its burr. Sometimes she had wondered if she would ever know this privacy and comfort again. That’s a wee bit of what breaking open the moment means. A WRITING PROMPT FOR YOU: Take a thin scene and break it open. Waffadillas — Get ‘Em While They’re Hot! You are such an artiste, friend. I thought the picture had said the thousand words, but, no….you did it. nd under a thousand, I think.